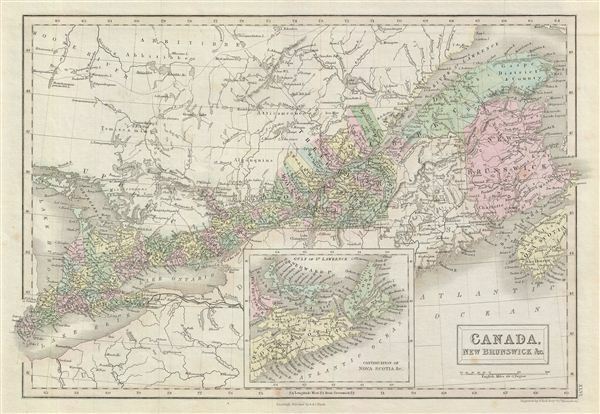 A fine example of Adam and Charles Black's 1851 map of Quebec (Canada east or Lower Canada) and New Brunswick. Following the St. Lawrence River Valley from Montreal eastward to the Gulf of St. Lawrence, this map covers what is today Montreal, Quebec, and New Brunswick. An inset map near the bottom margin of the map details Nova Scotia, Cape Breton Island and Prince edward Island. Throughout, the map identifies various cities, towns, rivers and an assortment of additional topographical details. Map is hand colored in pink, green and yellow pastels to define boundaries. The map is engraved by S. Hall and issued as plate no. XLVI in the 1851 edition of Black's General Atlas. Rumsey 2305.054 (1854 edition). Philips (atlases) 4334.